"Texas judicial candidate embraces Trump and hot-button issues while raking in out-of-state donations" was first published by The Texas Tribune, a nonprofit, nonpartisan media organization that informs Texans — and engages with them — about public policy, politics, government and statewide issues. This isn’t something you see every day in Texas: A big wad of money from outside the state, including a $5,000 donation from PayPal co-founder and billionaire Peter Thiel, flowing into the coffers of an avowedly pro-Trump candidate in a local court race. In another indication of the big money flowing in the race, one of Toth’s major non-Texas donors, former hedge fund manager John Thaler of Greenwich, Connecticut, has notified the Texas Ethics Commission that he plans to exceed a $5,000 expenditure cap the candidates agreed to; that allows Toth’s opponents to ignore donation and expenditure limits. Toth is leading the fundraising race in a four-way Republican primary that also includes Donna Davidson, Jennifer Freel and Kristofer Monson. The victor will face Democrat Gisela Triana in November. Rice University political scientist Mark Jones, who highlighted Texas’ uncommon system for electing judges in a recent Baker Institute paper, said the source and size of Toth’s donations, plus his overt embrace of conservative policy positions, all make his campaign unusual. But Jones calls it a logical outgrowth of forcing judges into the same partisan primary environment that candidates for governor, the Legislature or Congress face. There’s no question about the power of the court: The 3rd Court of Appeals, whose six members are all Republicans, hears important state government and regulatory cases. Its 24-county jurisdiction includes Travis County, where the Capitol, top politicians’ offices and major government agencies are located. Among the groups with ethics-related cases pending before the court: Empower Texans, whose oil-money-rich political action committee contributed $15,000 to Toth, and the Texas Home School Coalition, which endorsed Toth. The coalition noted that he received the endorsement after filling out a questionnaire and sitting for an interview with the group. Another donor, Florida lawyer Joel Lumer, contributed $5,000 to Toth for his primary, $5,000 for a potential runoff and also gave Toth’s family $24,000 for their children’s college funds [plus a Canon Ef 200mm lens and a “monetary gift” of $2,268], according to campaign records and personal financial statements on file with the Texas Ethics Commission. Toth called Lumer a “longtime friend” of his family. Lumer declined a request for comment about Toth. Toth was also editor of The Stanford Review, which was founded by Thiel, at Stanford Law School. Tactically speaking, that’s not common for judicial candidates, who typically promise to adhere to a certain philosophy but mostly avoid taking strong positions on controversial social issues that could come before their court. Jones, the Rice professor, says voters should brace for more candidates like Toth if he gets elected. “It’s a new twist, but if it’s successful it wouldn’t be surprising to see it become more common come 2020,” Jones said. Texas judicial candidate embraces Trump and hot-button issues while raking in out-of-state donations By Jay Root March 2, 2018 This isn’t something you see every day in Texas: A big wad of money from outside the state, including a $5,000 donation from PayPal co-founder and billionaire Peter Thiel, flowing into the coffers of an avowedly pro-Trump candidate in a local court race. Candidate Michael Toth, a special counsel in the office of Attorney General Ken Paxton, has pulled in $151,000 so far in the 3rd Court of Appeals GOP primary contest, and more than a third of it comes from out of state, records show. In another indication of the big money flowing in the race, one of Toth’s major non-Texas donors, former hedge fund manager John Thaler of Greenwich, Connecticut, has notified the Texas Ethics Commission that he plans to exceed a $5,000 expenditure cap the candidates agreed to; that allows Toth’s opponents to ignore donation and expenditure limits. Toth is leading the fundraising race in a four-way Republican primary that also includes Donna Davidson, Jennifer Freel and Kristofer Monson. The victor will face Democrat Gisela Triana in November. Rice University political scientist Mark Jones, who highlighted Texas’ uncommon system for electing judges in a recent Baker Institute paper, said the source and size of Toth’s donations, plus his overt embrace of conservative policy positions, all make his campaign unusual. Republican court candidate Mike Toth, going beyond the typical tactic of promoting a certain judicial philosophy, is openly embracing Donald Trump and hot-button social issues in his race for the 3rd Court of Appeals. This is one side of a recent mail advertisement he sent out. Mike Toth But Jones calls it a logical outgrowth of forcing judges into the same partisan primary environment that candidates for governor, the Legislature or Congress face. “It’s a natural evolution of having direct election for judges,” Jones said. “If the post exercises power, then it makes perfect sense for people who want to influence the direction of power to give money there.” There’s no question about the power of the court: The 3rd Court of Appeals, whose six members are all Republicans, hears important state government and regulatory cases. Its 24-county jurisdiction includes Travis County, where the Capitol, top politicians’ offices and major government agencies are located. Among the groups with ethics-related cases pending before the court: Empower Texans, whose oil-money-rich political action committee contributed $15,000 to Toth, and the Texas Home School Coalition, which endorsed Toth. The coalition noted that he received the endorsement after filling out a questionnaire and sitting for an interview with the group. Another donor, Florida lawyer Joel Lumer, contributed $5,000 to Toth for his primary, $5,000 for a potential runoff and also gave Toth’s family $24,000 for their children’s college funds [plus a Canon Ef 200mm lens and a “monetary gift” of $2,268], according to campaign records and personal financial statements on file with the Texas Ethics Commission. Toth called Lumer a “longtime friend” of his family. Lumer declined a request for comment about Toth. Toth was also editor of The Stanford Review, which was founded by Thiel, at Stanford Law School. Meanwhile, Toth pointed to a long list of endorsements from prominent Texans and homegrown donors — including Dallas investor Harlan Crow and U.S. Rep. Lamar Smith, R-San Antonio — and said he’s getting support because they know him as someone with “a heart for public service and a passion for the rule of law.” “I’ve worked side-by-side with AG Paxton for tougher border security, to roll back federal regulations and to defend religious liberty,” Toth said. “I'm ready to serve.” Toth isn’t shy about touting his Tea Party bonafides and running on the same issues that non-judicial candidates use to attract Republican primary voters. 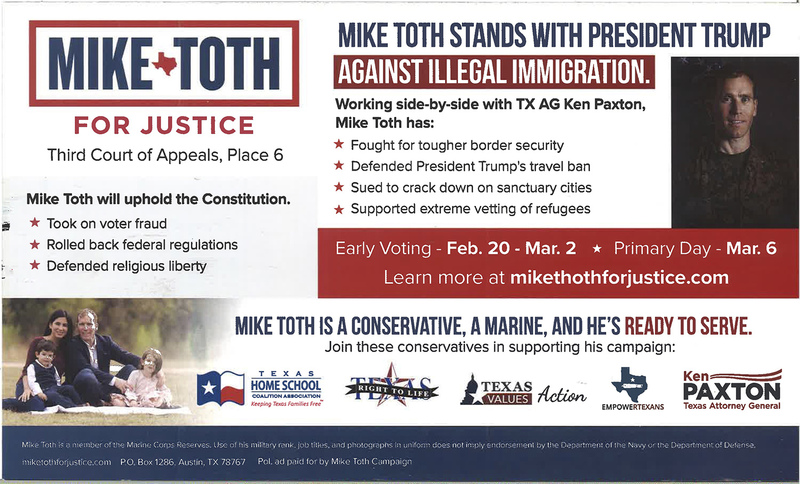 In one mailer, Toth brags that he fought for “tougher border security, defended President Trump’s travel ban, sued to crack down on sanctuary cities” and “supported extreme vetting of refugees.” Republican court candidate Mike Toth, going beyond the typical tactic of promoting a certain judicial philosophy, is openly embracing Donald Trump and hot-button social issues in his race for the 3rd Court of Appeals. This is one side of a recent mail advertisement he sent out. Mike Toth Tactically speaking, that’s not common for judicial candidates, who typically promise to adhere to a certain philosophy but mostly avoid taking strong positions on controversial social issues that could come before their court. “As all lawyers must always do, I will guard against any conflicts,” Toth said. 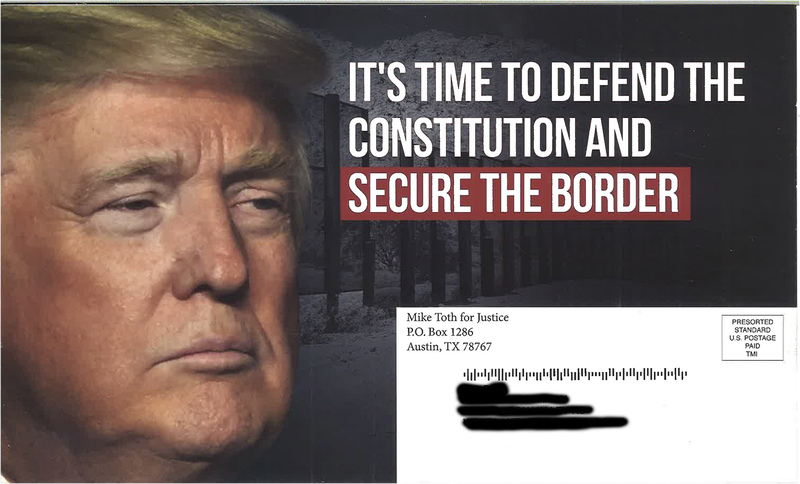 “If elected, I will rule impartially based on the facts and law in the cases that come before me.” Former Texas Supreme Court Justice Tom Phillips, a Republican, said he’d “never seen anything quite like” the mailer Toth sent out. “I’m concerned anytime a judicial candidate suggests, even indirectly, that his or her election will lead to a particular policy outcome,” Phillips said. “To conduct a campaign based on your view of hot-button political issues confuses rather than than enlightens the electorate.” Jones, the Rice professor, says voters should brace for more candidates like Toth if he gets elected. “It’s a new twist, but if it’s successful it wouldn’t be surprising to see it become more common come 2020,” Jones said. Disclosure: Rice University has been a financial supporter of The Texas Tribune, a nonprofit, nonpartisan news organization that is funded in part by donations from members, foundations and corporate sponsors. Financial supporters play no role in the Tribune's journalism. Find a complete list of them here. Read related Tribune coverage In Texas Republican judicial primaries, do Hispanic-sounding surnames spell loss? Trial begins in case targeting Texas' statewide elections of judges "Texas judicial candidate embraces Trump and hot-button issues while raking in out-of-state donations" was first published at by The Texas Tribune, a nonprofit, nonpartisan media organization that informs Texans — and engages with them — about public policy, politics, government and statewide issues. Link back to the original article, which is located at https://www.texastribune.org/2018/03/02/over-13-pro-trump-candidates-money-comes-non-texas-donors-including-pe/.